Ivan Cheparinov from Bulgaria won the Ruy Lopez chess tournament by collecting 5.0 points after 7 rounds in this all-play-all competition. In the last round he had white pieces against Michael Adams from England, who was only half a point behind and needed a win in this game to reach the first place. The final result was draw and Adams finished second with 4.5 points. David Lariño played surprisingly well throughout the competition, but then stumbled in the last round against Indian star Humpy Koneru. Fabiano Caruana sacrificed two pawns in the opening against Manuel Perez Candelario and then stormed towards opponent’s poorly protected castle. 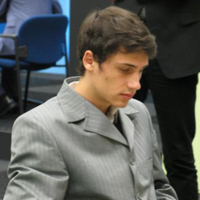 The attack paid dividends and Caruana walked away with a full point to reach 50% score.